Australia not only has the excellence for providing international education but great opportunities also to form a global network. Over the years, the educational institutes of Australia have nurtured the needs of its students by focusing on practical learning and a thorough understanding of different topics. Like other countries, the education system of Australia is mainly divided into three broad areas – Primary School, Secondary/Senior Secondary School and Territory Education. Senior Secondary: It starts from the years 11 and 12 and runs for two years. Territory Education: It includes both higher education and Vocational education and training (VET). Australia is internationally recognised for providing the best practice in vocational and education training as the individual is assessed on his or her procurement of competencies and focus is given on the development of skills relevant to field of skilled specialisation. Foundation Studies in Australia is also one of the great options for who wish to be a part of Australian university. Such programs are specifically designed for international students that allow studying a pre-university year within a full-accredited specialist program and typically last for maximum one year. 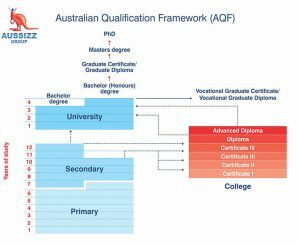 Established in 1995 by the Australian Government, the Australian Qualification Framework helps to make sure that the qualification titles across the country are consistent and represent the same high standards of education. It includes all Australian qualifications with clear rules about the level of education each qualification represents. This provides many benefits to international students as they find the best course and institution suitable to their needs without wasting time understanding different qualification titles. International Students who are studying and AQF qualification can always be sure of their institution to be Government authorised and nationally accredited and the degree to be genuine. Being an international student, one must choose to study in an institution, which is registered on the CRICOS (Commonwealth Register of Institutions and Courses for Overseas Students) It is a registration of Australian education institutions, which is managed by the Australian Government Department of Education that allow educational providers offer courses to overseas students who are studying or intending to study in Australia on student visa.